Four variations are proposed ranging from a minimalist-boho inspiration to a chic-Derby trend. Beige version: I present you this hat, fascinator, fascinator, pillbox made Lese in natural. The diameter of the cuff is 13 cm and fit into the hair is done by a comb hair. Couture, geometric, inspired Art Nouveau. I let you choose. The Brown version: pillbox hat for a wedding, ceremony woman Hat hatinator derby candy... made of woven Brown straw with velvet beads in different colors. 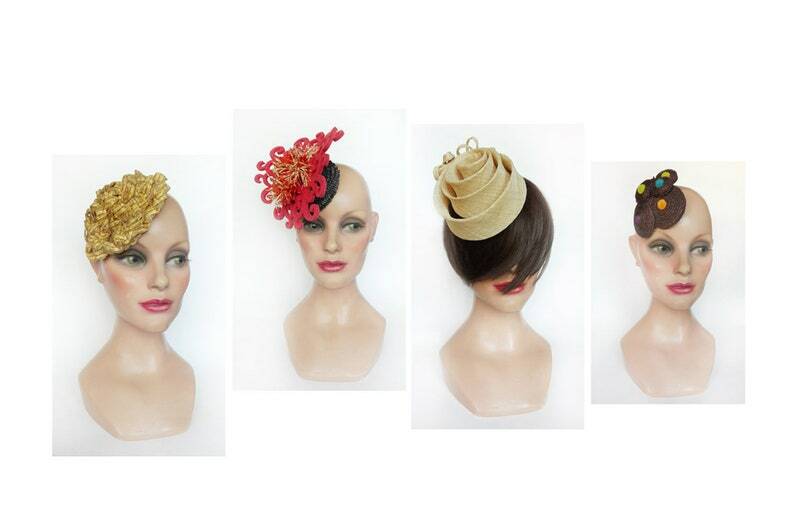 Keeping in the hair is done by long clip 7 cm black hair and the diameter of this hat is 10 cm. For the Orange version: fascinator made of natural fancy straw braid of black color, Orange polyester felt cut into arabesques, fringe and Brown beads. Structural, this Hat will be perfect to bring an orange-chic tip to your ceremonial outfit. The diameter is 17 cm and a silver metal comb allows the maintenance. For the yellow version: minimalism, simple elegance characterizes this hat. Made with old vialaton braid, it can be fastened in the hair with a haircomb or headband. Its diameter is 16 cm.